This blue form of the mineral pectolite is believed to have been affected by volcanic ash thousands of years ago, giving it the unusual blue sheen. Larimar is one of the most complete healing stones in my opinion; if you choose only one stone to carry or wear, consider this one. 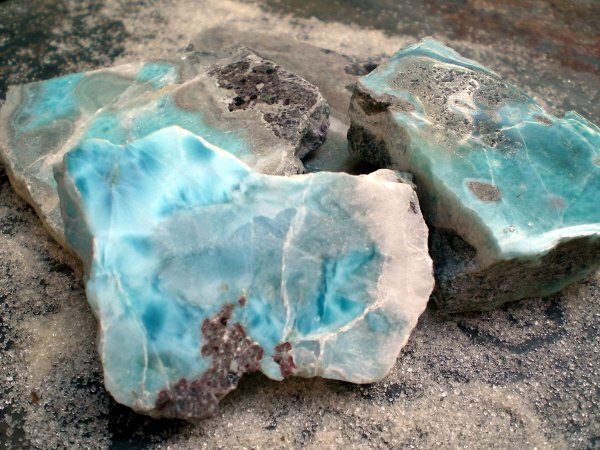 Larimar is found only on the island of Hispaniola in the Dominican Republic, where it is becoming scarce. There is little historical reference to it prior to the early 1900’s, so it is not known whether the native Taino culture of the island used the stone or not. Crystal energy experts report that this stone is amazingly tuned into the energies of the human body, making it an outstanding healing tool. I personally agree with this, and carry a Larimar with me at all times, especially for its calming nature. Here is the list of Larimar’s many properties, and information on its other names below. 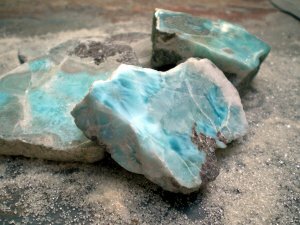 Larimar was known as Atlantis Stone for many years through the 1980’s in Europe, and continues to carry that name in many circles today. The ties to Atlantis stem to a degree from the predictions of the late Edgar Cayce to coincide with the "rising" of Atlantis. Cayce predicted a blue healing stone would be discovered in this century on a Caribbean island, just as Larimar was. 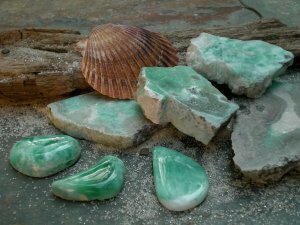 Many people with interests in and energetic connections to Atlantis are able to feel energies, detect and sometimes decipher information from that lost civilization in Larimar. Dolphin Stone is another popular name for Larimar, perhaps because of the lovely marine mammals’ association with Atlantis, or the fact that many practitioners use Larimar as a tool to enhance communication with sea creatures. What’s interesting is that this stone often exhibits patterns with dolphins, angels, and Greek columns, as well as other easily recognized images.